Note: Chef Antonin Bonnet has now left and been replaced by chef Arnaud Bignon from the two-starred Michelin restaurant Spondi in Athens. I was lucky enough to be invited to sample the new limited edition Laurent-Perrier champagne pairing menu recently launched at The Greenhouse for the festive season. The House of Champagne Laurent-Perrier, founded in 1812, is one of the most recognisable and famous champagne brands in Europe. The Greenhouse is a one Michelin-starred restaurant in the heart of Mayfair and is well known for its Asian-inspired French cuisine. The menu matches five of Laurent-Perrier’s most prestigious and pioneering champagnes with a selection of dishes created by head chef Antonin Bonnet. Each course is designed to enhance the lightness, freshness and elegance of each of the Laurent-Perrier champagnes in the menu. Antonin Bonnet is a protégée of the famous three Michelin-starred chef Michel Bras, and this influence shows in his elegant and refined cooking. I have been to The Greenhouse several times and I adore the food (my last blog post for The Greenhouse is here), and this evening had the makings of a glorious affair. The evening kicked off with a salmon canape followed by an amuse of runny hen’s egg. 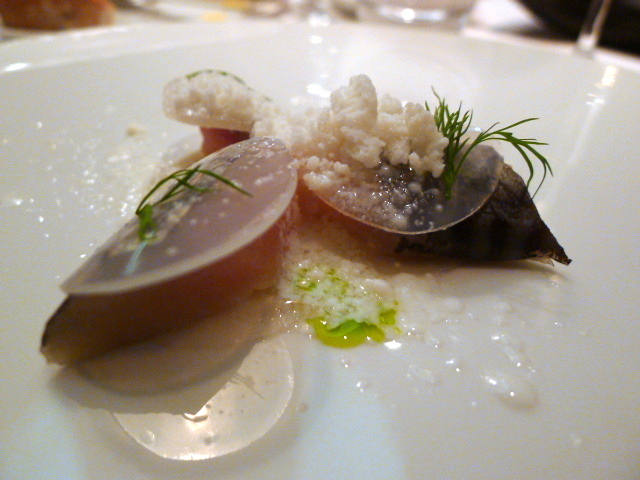 This was followed by our first course of a refreshing apple cider marinated mackerel with horseradish snow and pickled black radish. The zingy acidity of the cider was a wonderful match against the oiliness of the fish, and the freshness of the snow added a touch of spark to the dish. The accompanying champagne was Laurent-Perrier Ultra Brut which had lovely hints of citrus. 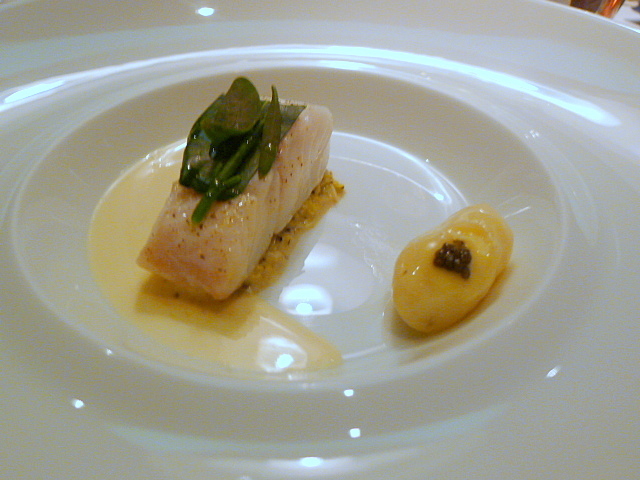 Atlantic cod was perfectly cooked, leaving it moist and opaque throughout. The accompanying leek fondue and champagne sauce were wonderful. Also enjoyable was the smoked potato topped with caviar. Hints of yuzu ran through the dish to give it a glittering quality. To go with the cod was the 2002 Laurent-Perrier Vintage. Bottle-aged for almost eight years, it is well known for its complexity. Poached Scottish lobster was delicious and meaty. 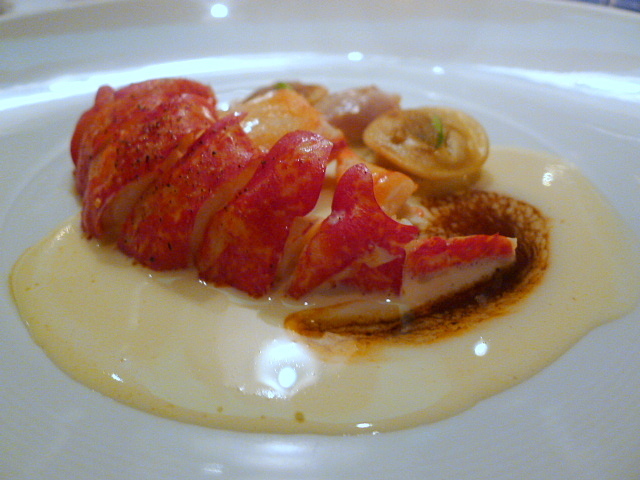 It had been finished with a lobster bisque which was heavenly for both its intensity of flavour and feathery lightness. Accompaniments included cep mushroom ravioli which was a touch crunchy, and a flavoursome chicken oyster. This was paired with the prestigious Laurent-Perrier Grand Siècle, which with its depth, finesse and complexity, rounded off a masterful course. This was my favourite champagne of the evening. 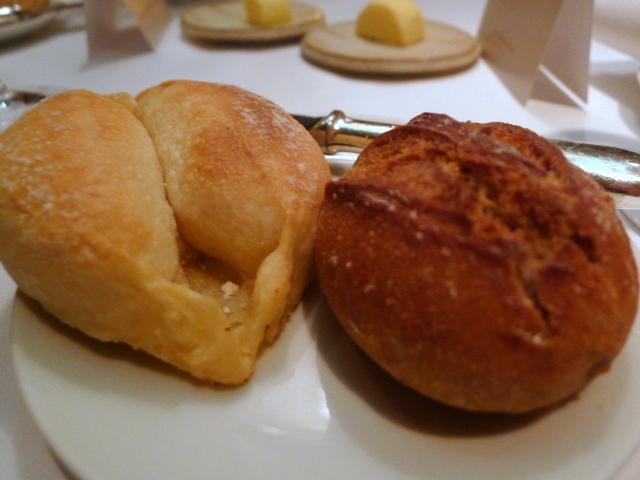 The chestnut bread was good, but it was the butter bread that was to die for. It oozed lots of wonderful buttery goodness, and was so good I couldn’t stop at one. A pre-dessert of pineapple sorbet with coconut foam was refreshing and light, and had been paired with the Laurent-Perrier Demi Sec. 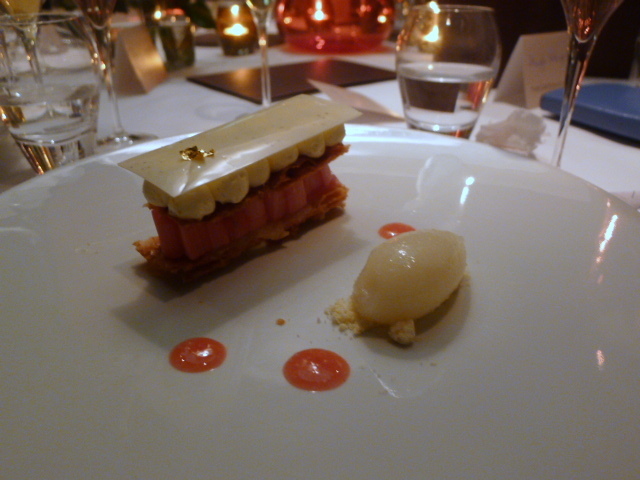 The rhubarb in a rhubarb millefeuille was a touch too sharp and firm for my taste, although I know of many who love rhubarb that sings with this level of tartness. The puff pastry was expertly executed and was flaky and light. A pear sorbet rounded off the dessert nicely. Laurent-Perrier Cuvée Rosé with its berry tones was a lovely match. 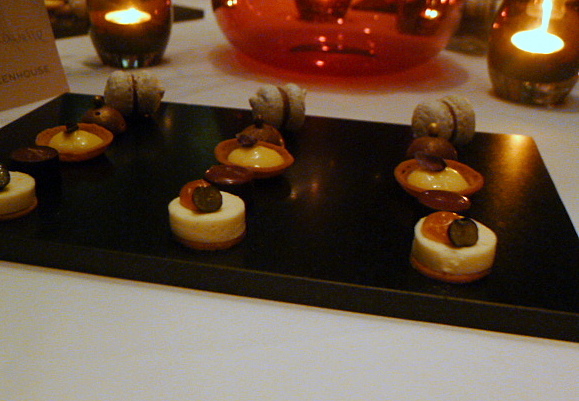 To finish was a selection of petit fours. This was a superb menu with heavenly, magical flavours. Bonnet has a subtle, delicate way of combining classical French techniques with Asian nuances which is quite inspirational. I’ve often wondered why he hasn’t won a second Michelin star. This was a faultless, superlative and luxurious dining experience. The Laurent-Perrier champagne pairing menu is available at The Greenhouse from now until December 2011 and is priced at £240 per head.